I didn't even know what I was supposed to do. I started to cry. Lol. I shed tears for about 15 minutes. After a while, I decided that today being the first day should be about stating what I intend to achieve at the end of the fast. Thereafter, a song popped up on my mind. I hummed it. Sang it softly a few times. And sang it even more passionately. It was a perfect description of my Heart Rays at the time. I had realized I couldn't go any further without God. I needed to surrender it all. Thereafter, it felt like God was responding to my heart. "I love you, Amaka. My love for you runs deep like a river. I come to give you life, love and light." I felt good. Really good. "It is better to boast on God's love for you than boast on your love for Him. Because while your love can grow cold, God's love is constant." I felt better. Refreshed. Loved. I have been trying too hard to earn God's love because I had forgotten that nothing I do can reduce or increase the magnitude of love He already has for me. I breathed out anxiety from my heart and breathed in the love of God into my heart, and prayed to always bask in His Love. God loves me. That's all that matters to me right now. This fast has been a life-altering journey. It seemed like God opened my heart and made me look inside it. I am amazed at myself. You might think it’s crazy that I took this fast and chose not to talk to men for 30 days but God has really been showing me some powerful things about myself. I'd recommend it for every single woman to do it at least once in her life. 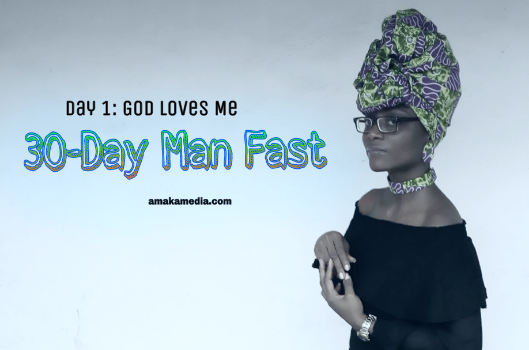 Personally, this fast was mainly about staying away from distractions (men) and getting back to the heart of God and my purpose. I also didn't want to start a new relationship without first dealing with my innerman. I still have some days to go. Slowly, but surely I will get there. What's your relationship with God looking like right now?